I don't think I have been this excited about thermal nail polish ever. I have the most gorgeous trio of thermal nail polish to share from Paint It Pretty Polish today and I think you're all going to flip your bananas over these colours. This trio releases on September 14, 2018; they will be available individually for $10 CAD each (which is a total steal). 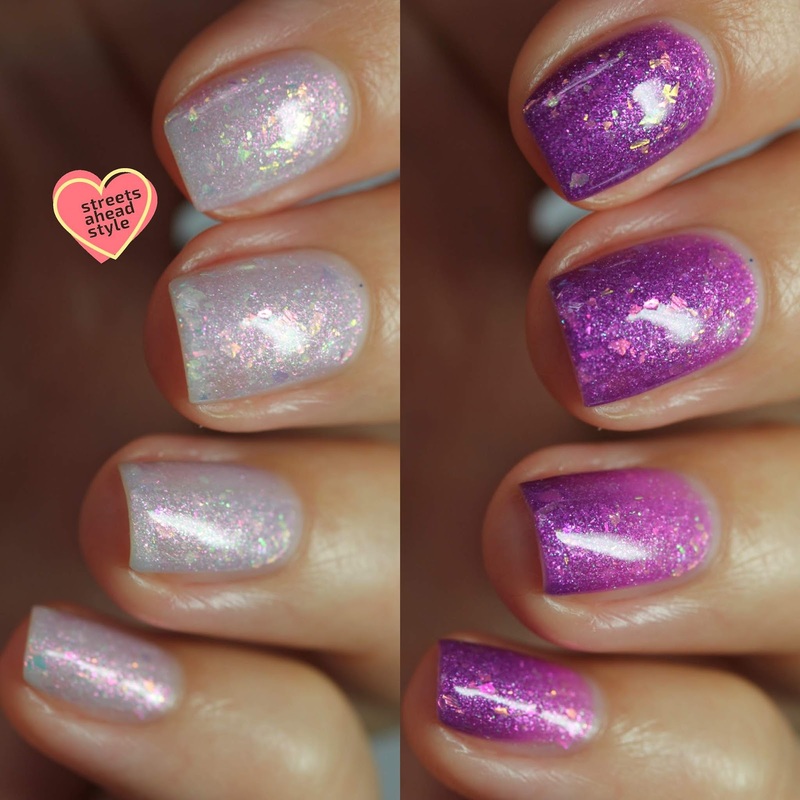 These polishes were named by members of the Paint It Pretty Polish Fans group. Sherri often does naming contests so join for your chance to win in the future! Paint It Pretty Polish Unicorn in Disguise is a purple (cold) to colourless (warm) thermal with purple/aqua aurora shimmers and red/green/gold iridescent flakes. Oh. My. Lanta. I don't think I can put into words how much I love this polish. The thermal transitions so effortlessly and it gets really deep in purple and then totally colorless (which is like a white but it's so packed with shimmers you just see the Aurora shimmer and flakes). This looks like an opal and you know how I love opals. I am wearing three thin coats plus top coat (best way to wear it so the flakes build up). I want to wear this forever. As it transitions between the two extremes, it's a gorgeous fuscia pink. UGH. UGH. UGH! Perfection. 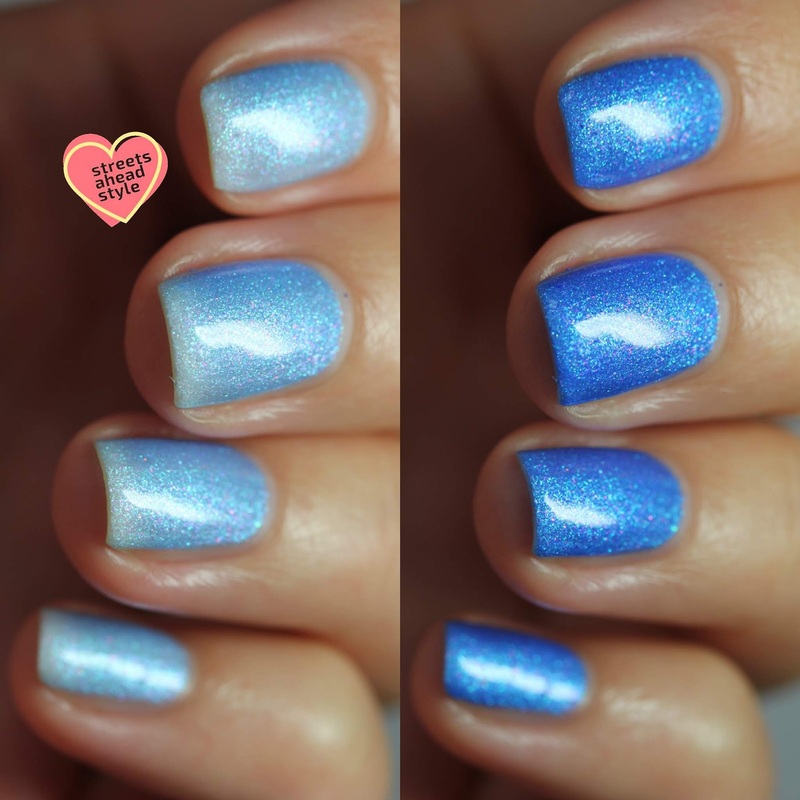 Paint It Pretty Polish Aurora's Tear Drop is a blue (cold) to colourless (warm) thermal packed with blue/pink aurora shimmer. This is the perfect Princess nail polish. It's like Cinderella's dress when it's in the warm state and a stunning icy blue. The shimmers just pop in this one. The pink shimmer is delicious and gorgeous. I am wearing two effortless coats plus top coat. I think this will be a new favorite for Winter. Paint It Pretty Polish Sea Dreams is a blue/green (cold) to colourless (warm) with red/gold/green aurora shimmers and aqua/green/pink iridescent flakes. Holy moly! The shimmer and flakes in this make it look like an actual mermaid tail on your nails. I have ever been so smitten with a green as with this polish. Even though it is colourless when it's warm... it's anything but! The red shimmers really pop when it's warm and the flakes stand out so well. Another opal-like polish but this one has more of a mermaid twist. Maybe an underwater opal? If those exist, then they have to look like this nail polish. Sherri has blown me away, yet again. Do you plan to pick up any of these awesome thermal shimmery polishes? They happen to be made in Canada and Sherri who makes Paint It Pretty Polish is super awesome! I love this collection so so so so so much. Maybe my favorite thermals ever? Sherri has blown me away again. I was smitten with her magnetics and now these thermals!! !